Route summarization is a method of representing multiple networks with a single summary address. It is often use in large networks with many subnets because it reduces the number of routes that a router must maintain and minimizes the traffic used for routing updates. Two methods for summarizing routes exist: automatic summarization and manual summarization. By default, EIGRP has the auto summary feature enabled. Because of this, routes are summarized to classful address at network boundaries in the routing updates. To better understand the concept of auto-summarization, consider the following example. 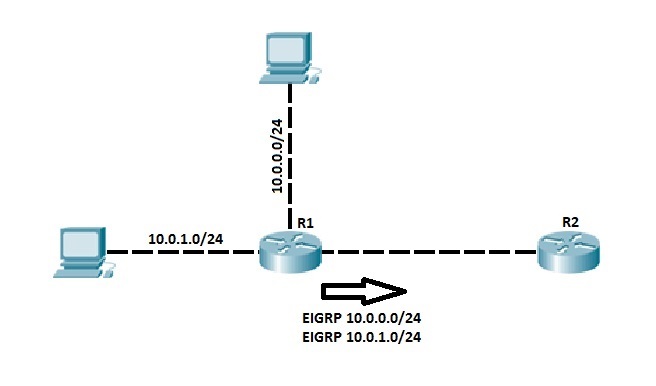 Router R1 and R2 are running EIGRP. Router R1 has the locally connected subnet 10.0.1.0/24 that is advertised to the router R2. Because of the auto summary feature, the router R1 summarizes the network 10.0.1.0/24 before sending the route to R2. With the auto summary feature turned on, R1 sends the classful route 10.0.0.0/8 to R2 instead of the more specific 10.0.1.0/24 route. After typing the no auto-summary command, the neighbor relationship will be re-established. One of the advantages of EIGRP over some other routing protocols (like OSPF) is that manual summarization can be done on any router within a network. A single route can be used to represent multiple routes, which reduces the size of routing tables in a network. Now R2 has only one route to reach both subnets on R1. In the example above, the ip summary command included two subnets on R1, but also some other addresses that are not in these subnets. The range of the summarized addresses is 10.0.0.0 – 10.0.255.255, so R2 thinks that R1 has the routes for all addresses inside that range. That could cause some problems if these addresses exist somewhere else in the network.